I lovve this templete,it´s clean and classy. Hi! I also make blogger templates but I can't help admire other people's templates as well. This particular template holds a great power hidden in its simplicity. Love this template I'm a recent free from marriage and I want to bear all my skins(meaning my journey after divorce) in my blog do you think you could come up with one similar for me? 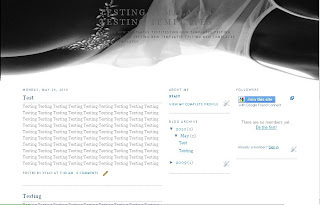 Ive been playing with blogger templates for years and this is stunning. 3.the word "Recentes" and "Anteriores" appear when categories is selected. How to change these word to English?